The Ultimate Machine to Harvest IR Excellence. These are the tools of the premier IRO’s across a wide array of industries. Let us do the work for you—you can interact with an IR expert as part of your Interactive Subscription. Delivering the entire IR spectrum of world-class tools to your fingertips. Database built from a vast network of input from top IRO’s and CFO’s, successful buy-side investors and award-winning sell-side analysts. 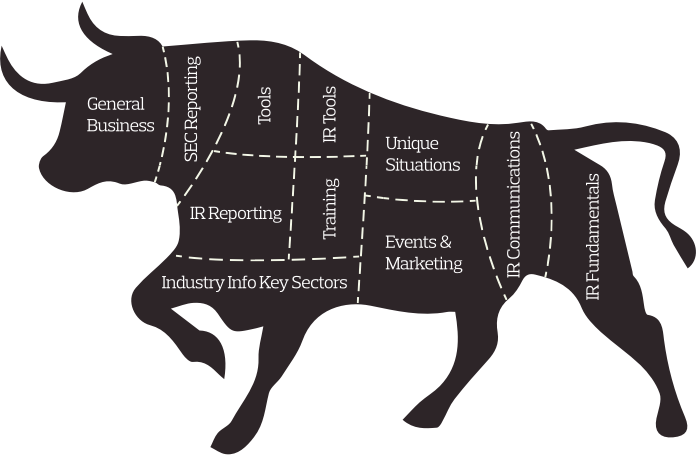 You now have access to the tools of the best IR professionals on the Street. Use The Barn to save significant TIME and MONEY. It contains best practices, examples, white paper overviews, templates and answers to virtually any aspect of interacting with Wall Street. Your Interactive Plan includes access to live IR experts whenever you have a question or need. Ask us anything. With your Interactive Plan, if you have an IR question or need and it is not in The Barn, you get priority status and a 25% discount on all projects. We have 2 subscription plans (free and fee) which give you full control and ultimate flexibility. To get a glimpse into the power of The Barn, take a look at the breadth of categories and topics that span the IR spectrum. Gain access today to the most powerful IR resource on the Street. There are 2 subscription plans available to you, both of which have no commitments. © 2019 IR Barn. All rights reserved.